Tbilisi these days is full of rumors. Supporters of the defeated ruling party argue that the cases of robbery in the city and the country as a whole have become more frequent, and the return of thieves in law is inevitable. The victorious opposition claims that the police is engaged in sabotage, using the criminals to intentionally worsen the crime situation. But the main topic of discussion today — how the system of government will be arranged in the transition period. After the landslide victory of the opposition in face of Bidzina Ivanishvili’s coalition «Georgian Dream» in Georgia they have started to talk about the risk of returning of thieves in law to the country. For example, the former Minister of Economy Kakha Bendukidze does not exclude such a possibility. «Such danger does exist, since we know that the thieves in law were involved in the fight on the side of Ivanishvili. But I do not know if they would manage to do this given the powerful opposition and the president, who has the right to appoint the heads of security agencies — the Ministry of Interior, Ministry of Defense and the Ministry of Justice — for a year, until the completion of the political reform in Georgia. In this situation, we can prevent the thieves from abrupt returning», Bendukidze said in an interview to the PirWeli.com.ge. Meanwhile, the cases of robbery and pilfering have become more frequent in the regions. Thieves of all the regions specialize mainly in car batteries. In society they are considered allegedly controlled by special ministry for prison affairs. No one doubts that these thieves were hired to discredit the «Georgian Dream». In the air of the TV-channel «Maestro» one of the arrested thieves told that he had been promised an early release if he cooperates, that is to engage in petty theft and sometimes to beat someone. The thief told that he was forbidden to carry the stolen things to his house: he was to pass the stolen things to the customers. But the thief, of course, does not know the customer. But it’s clear who would want to undermine the credibility and image of the victorious opposition. One of the members of Ivanishvili’s coalition Soso Vakhtangishvili stated that despite the repeated warnings to the officials of Gori — police chief Beso Berianidze, district police chief Levan Kiria and the chief of patrol Tamaz Togonidze, no action to prevent crimes in the region was taken. 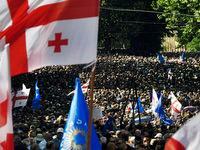 «They do not respond to the calls», Soso Vakhtangishvili said. «Their group encourages the criminality». Political scientist Khatuna Lagasidze believes that after the defeat in the parliamentary election the representatives of the «National Movement» have several main objectives, the main of which is to save their political future, which is a program maximum. And the minimum program is to escape justice and to withdraw from the country the wealth accumulated over 8 years of rule through «plundering the country and the people». «For them it is important to postpone the time of impunity», Khatuna Lagasidze said. Another fairly odious Georgian politician Temur Shashiashvili, the leader of the movement «Tetrebi» (Whites), requires impeachment and an early referendum. He claims that for the last months «United National Movement» had spent more than GEL 20 million from the state budget for the election campaign. Leader of the «Tetrebi» is confident that the representatives of the «National Movement» will lie in wait and will be much more dangerous than during the reign. Temur Shashiashvili demands to create a commission to evaluate the state of the economy after the election. In Georgia they are afraid that after the election the state treasury is exhausted, so that there is nothing to pay benefits even to the retirees. The leader of the winning party, billionaire Bidzina Ivanishvili proposes to supplement the budget with his own account. «I’ll add from my own money», said the leader of the «Georgian Dream». But in Georgia, the people regard Ivanishvili’s generosity in different ways. Former Economy Minister Kakha Bendukidze says he does not really understand this approach. «I think there is no such a modern social system when the prime minister or party leader would have contributed the money into the budget». Relations between the new leader and the businessmen of the country are also different. At a recent meeting with them Bidzina Ivanishvili stated he would try to return Georgian products to the Russian market in the near future. «Though I haven’t been in Russia for 10 years, I have great hope that we will soon be able to restore trade and cultural relations. I do not have any document on this occasion, but I think that Russia is not satisfied with such relationships, and if we do efforts in order to restore trade and cultural relations without any preliminary conditions, I hope we will reach a positive result», Ivanishvili said. He stressed that «if everything goes right, it’s possible that Georgia will be able to sell to Russia citrus crop of this year».